We ended our second day of pavilion hopping at the Brazilian pavilion. It is a little humid in the venue – but with the amount of dancing and movement in the building, you’ll understand why. You most likely will also contribute to that heat when you, yourself, are dancing in your seat! There are two photo booths were you are able to stick your face into cutouts. With the options, you can either be right in the midst of a capoeira kick or heading into a soccer game. There are two straw umbrellas holding up a Brazilian flag with more trivia on them. From the umbrellas hang a few monkeys, also with trivia about Brazil. Also, just to the left of this are tables with artefacts and information boards. To the right of the cultural display are a group of vendors eager to talk about their products. Pre-packaged gourmet chocolate was a popular stand this evening, and it’s a great place to check out between shows. We did not order food at this venue, already having stuffed our faces at the last two. However, a fellow guest at our table recommended the fejouada, a stew mainly of beans, beef and pork. If you’re staying for their late night party, try the cachaca, a sugar cane spirit. 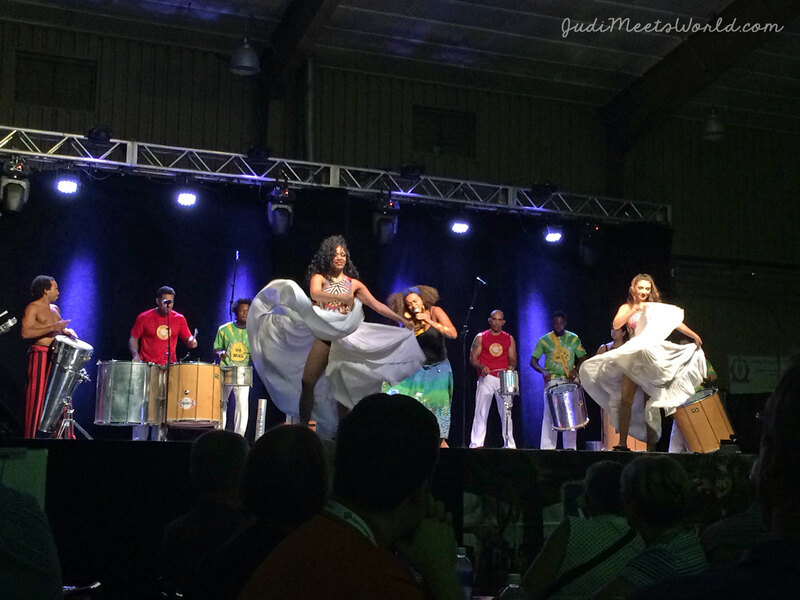 Brazilian has become synonymous with the samba music in Winnipeg. Equipped with various types of drums and other instruments, the Viva Brazil group plays with enough strength to keep your heart beating in rhythm with their beats. Mestre Gabriel once again leads as a conductor of sorts with his unique talent of playing incredible rhythms with one drumstick in hand. Mestre Indio and two others also took the stage with the traditional instrument berimbau. There is even an audience participation piece led by Mestre Gabriel. Get your hands ready for the clapping! Capoeira is a mainstay of Brazilian entertainment and this evening showcased both youth and the mestres themselves. The ladies also came out for their samba number with white feather headpieces and matching fans. They also had intricate beadwork on the bodice of their costumes. This year, they even added a surprise storyline in the samba routine – come see to find out! This pavilion is one that gets you up on your feet dancing, and sends out the door feeling energized! Viva Brazil is the group that performs on stage annually and this year they made a note that you can take the pavilion home with you! Available in the Marketplace area are CDs recorded by the group. Imagine, that same samba that got you smiling, clapping, and dancing along can be played at anytime or anywhere! If you love what you hear, support a local group and buy that CD! We had a great time at the Brazilian Pavilion. What were your highlights? Connect with me and let me know!